When I pick up a Japanese LN and read a fan translation these days, I try to look for titles that are different from anything we have releasing in English. I’m interested in experimental works–well-crafted stories with memorable characters and unique concepts. This title, which I’ll just refer to by its shorthand Bokushinu, was something that sounded interesting based on its premise: a girl named Hikari dies, but her spirit inhabits a boy classmate’s body–and they rotate each day who is “alive.” The lead boy Akitsuki is unconscious (or however you would term it) on the days Hikari is in control of his body. Also worth noting, this book won a Dengeki Novel Prize, which sounded impressive. As it turns out, the story actually plays out in a way that reminded me very much of the first act or so in the anime film (and novel) Your Name. It’s not exactly body-swapping since there’s only one body here, but there’s a lot of that same sort of confusion and silly antics at play. Only, as Kastel put it in our Summer Reading discussion, Bokushinu‘s heroine is “basically a horny anime fan.” Much of the plot in this story entails Hikari acting wild in various ways, and then the next day Akitsuki has to deal with the repercussions of her mischief-making. (They can only communicate through journal entries they leave each other.) Akitsuki meanwhile is basically a simplified version of characters like Ryuuji from Toradora and Hachiman from Oregairu — i.e. he looks rough and nobody likes him, and he’s a complete pushover. He also has a little sister (of course) who writes light novels (of course) and gets caught up in Hikari’s lewd shenanigans (…of course). Basically, this is a case of me expecting one thing from a novel, and getting something completely different. This is something along the lines of titles like Henneko and Oreimo in terms of tone and general focus. But for me though, even looking at this story as primarily a “wacky hijinks” romcom, most of the jokes just fall flat. The writing doesn’t stand out, and most of the plot is pretty disjointed and thus forgettable. Much of the beginning of the volume is devoted to a (rather silly) romance subplot with another classmate, for example–and then the final act of the volume abruptly brings in more of a drama subplot with yet another classmate. There are decent ideas at play here, but the overall execution leaves me wanting. One thing that I feel could’ve made the story more interesting: have it told from the points of view of both Akitsuki and Hikari, rather than only Akitsuki. Hikari’s situation is just as interesting (if not more so), but more importantly I think readers would have felt more “in the moment” with all the crazy things she did, rather than just finding out about them the following day. This perhaps could have made things funnier too, getting readers to anticipate how Akitsuki would later react to Hikari’s actions. Bottom line — I imagine fans of this sort of thing would probably be better served with titles like Haganai or Sakurasou. 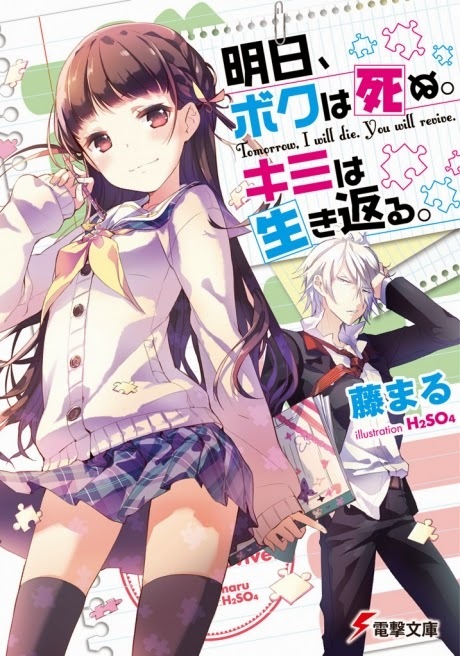 Or if you want a light novel series that specifically works with the concept of two souls in one body and their romcom drama, check out When Hikaru Was On the Earth. The fan translation for that one is a much smoother read, and the characters are a lot more memorable. Want to try this out when I saw it the other day, though not gonna lie, this is just about what I expect from it too, lol. If that’s what you already expect of it, then you should be better-prepared than I was! It is a story other people have enjoyed, so hopefully you can too. Yeah, I do want a lighter read after Book Girl. This one seems like it will be perfect for that.